As computers and algorithms become faster and smarter, area lights can be used more often without much performance penalty. Why would you use an area light? In the real world, lights of all types are represented in 3-dimensional space, meaning all lights have area from which they emit light. A tungsten light bulb has a tiny filament, the tube fluorescent light has a cylinder, and the sun has a disc. This means several things for representing light from the real world inside the computer. Light from an area source of appropriate size looks more natural. This is because our brains perceive light strength and size based on reflections of the actual light and the relative softness (spread) of the shadow. Recreating real-world lighting should be more natural because you should think in terms of the literal source from the set. Scenes in correct scale along with their lights should need less tweaking for the correct “quality” of light. In the legacy days of Maya and mental ray, you had to create a light such as a spotlight and ‘turn it into’ or convert it to an area light. This is no longer necessary and is in fact, deprecated. Don’t let anyone see you doing it! Instead you should create an actual area light and use the mental ray rollout to create an area light. 2. Intensity: This is the strength of the light. Incidentally this does not match anything like watts, etc. 3. 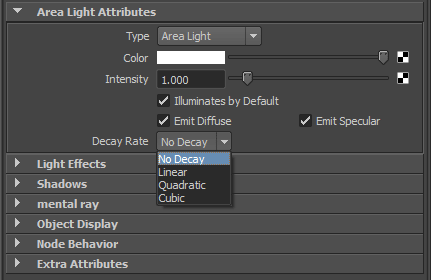 Decay Rate: To maintain a physically correct light source this should be set to Quadratic. In doing this you will find that your intensity will have to be increased very much depending on your scene scale. High values are perfectly fine. Lastly, time to turn “on” the mental ray area light shape. Under the mental ray rollout there is: Area Light -> Use Light Shape. Tick this “on”. Place this in a scene with the quintessential “sphere on a plane” setup and hit render current frame. Area lights can introduce grain into your render. Why? In order to correctly see an area light, the point being shaded needs to sample it. In doing this the shader will send rays back to the area light to try and see as much as possible. These points are spread across the surface of the light to avoid a regular pattern in exchange for noise that is more pleasing. Such a pattern might look very similar to that used for QMC sampling. You can control this locally for the light. How do you make sample decisions based on the light and the scene? First lets do a few different things to the light. 1. Color: Leave it black. In the past you would change this to “fake” an indirect light by giving it some color to mimic. We will assume you are using modern illumination techniques like Final Gather in your scene. Leave it black. For simplicity I will restate them here with his images and update them a bit. 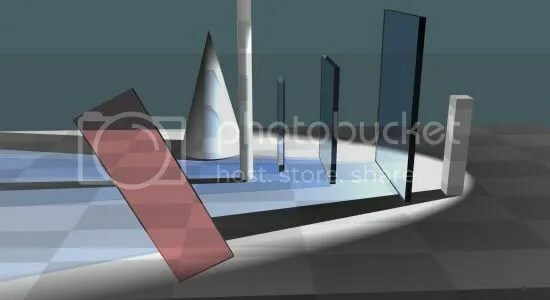 In order for a shadow to be seen in a reflection or refraction you must allow the shader to call the shadow after the ray has been reflected or refracted. 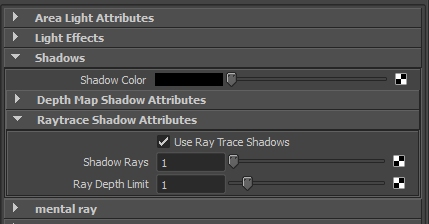 mental ray will count down the number of times this happens and eventually tell it not to sample for shadows (cast shadow rays) You see below this affects even transparent (colored) shadows and can make your scene look incorrect. Notice the red transparent rectangle and the view behind it. This is a useful optimization because shadow rays can be very expensive to propagate everywhere, especially from area lights. The defaults he mentions (2 for ray depth) are generally visibly acceptable for many scenes. Especially those with blurry reflections where such an effect isn’t noticed at all. However, a depth of 3 may provide you with the best quality if you can afford a little extra time. You will notice that the Final Gather preprocess phase will see the shadows at a depth of 3 (this is a Maya specific bug, 3 is also now the default in Maya 2014). Ok, so how do you make the light and shadows look good? Area lights have a section under the mental ray controls to provide samples. So let’s look at the settings you maybe have typically seen before Unified Sampling appeared. I have seen this section abused time to time. 1. 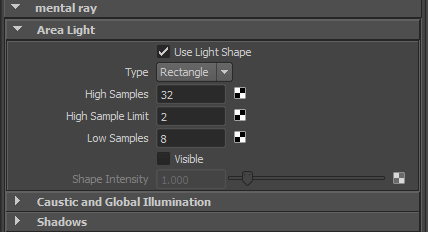 High Samples: this is the amount of samples to shoot (draw) towards the light when an eye ray strikes an object. This means primarily visible. You want this to be your most important level of quality. 2. High Sample Limit: Once this number of combined reflections/refractions is exhausted, the sample can draw fewer samples as defined by the Low Samples setting. 3. Low Samples: this is the amount of samples to draw for a sample taken after the number of reflections/refractions in the High Sample Limit have been exhausted. 4. Visible: Will the area light be visible in the render. In the case of the Portal Light shader it must be on to work correctly. The mia_material will also skip generating a specular highlight for a visible area light by default. 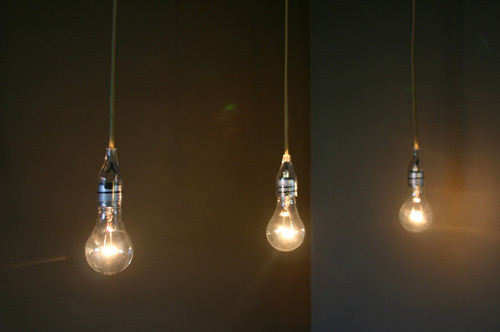 This is desired because a spec is a fake for a direct reflection of a light with no area. A light with actual area should genuinely reflect in the object. Doing both doubles the energy incorrectly. In many cases I see the High Sample Limit set to 16 or 32 without any understanding of what it really does. In this case up to a combination of 16 or 32 reflections/refractions will still draw 32 samples. In a scene with a lot of raytracing effects and depth, that’s murder on render time. Or similarly I see the Low Samples set to something obscene like 64! These examples were rendered with fixed pixel samples of 4 so only the effect of the area light samples is taken into account. Be careful with scaling an area light when you have a custom shader attached. Some shaders will scale the intensity of the light based on size. In many cases this is correct and desired for the shader, but it is not the default behavior. What about Unified Sampling and Brute Force? In testing scenes with large and multiple area lights (10+) as well as special area lights like the Native (builtin) IBL, we found low but not single samples are best. Generally speaking, a range from 4 to 8 is good. And in fact we have set the samples to (High, High Limit, Low) 4 1 4 or 6 1 4 and variations with good results. Quick metric: In an unreleased still (hopefully to be added later) I can render a car interior full frame at 6000 x 3376 with 11 area lights and brute force Unified Sampling in 2.5 hours. These area lights were set to 4 1 1 because the majority of reflections were very blurry/soft for leather and cloth. Further optimize your scene by selectively choosing what object may cast or receive shadows. For example: a car window may not need to generate shadow samples or even receive them to look good. 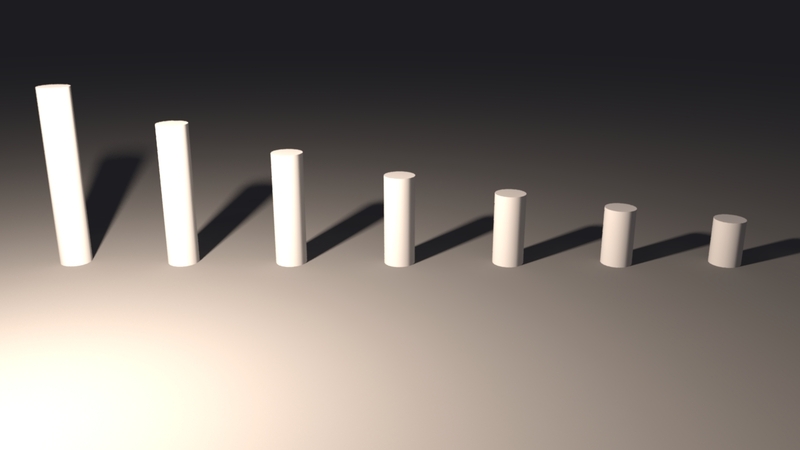 Understand that “clear” and “colorless” for shadow objects are not the same concept. Windex is clear, but it’s blue and should cast a blue shadow. Clean water is clear and colorless. When you have a lot of art directed imagery with lots of lights, you can reduce indirect illumination quality without image quality loss. This is especially helpful with lots of area lights. The Native IBL is a giant area light. When using this on exteriors and other images you can greatly reduce Final Gather settings since it will only return secondary lighting information. 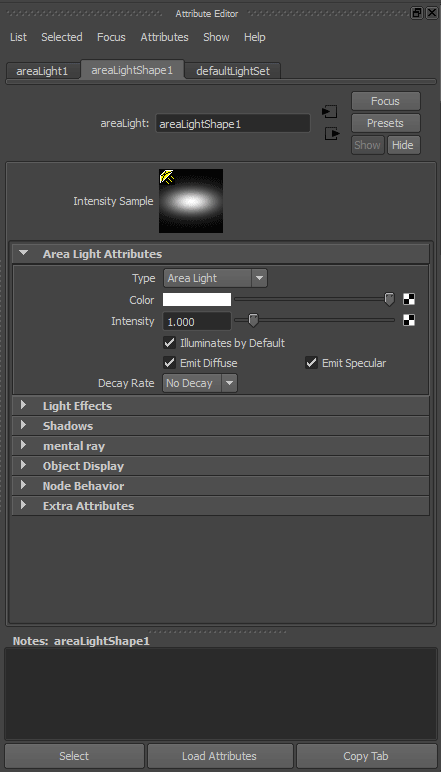 Area Lights generate multiple samples per eye ray sample. When you naively layer shaders this will increase the number of rays linearly. For example: plugging in a shader to the additional color of a mia_material and then assigning it will double the number of rays shot (For this example 2 shaders are run for the light loop: 2 * total lights * samples = a lot of rays) Try to avoid this by keeping networks simple or using mib_interpolate to use importance and weight to run a shader layer. In the render settings you will see an option for Sample Lock underneath Jitter. Sample Lock keeps similar sampling patterns across frames. In the case of Area Lights you may see a static noise pattern slide over your animation frame to frame. Disable this feature to randomize the pattern and generate noise which may be acceptable when seen in motion. 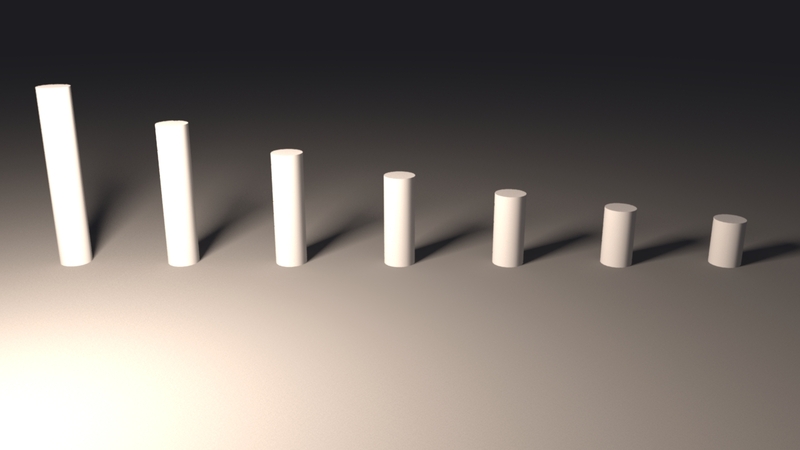 I didn’t use depth map shadows. Mostly because I am using Unified Sampling and want a fast and accurate setup. If I were using the rasterizer, need lots of soft shadows, and want motion blur, then I would possibly use Detail Shadow Maps. 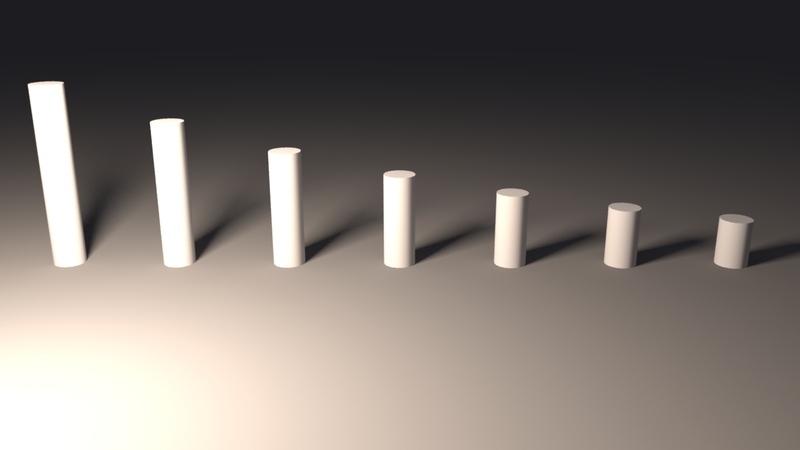 Detail Shadow Maps can generate very slowly at first but motion blurring them is inexpensive. I can also save a detail shadow map for certain parts of a scene (or a whole scene) and reuse them from disk at significant time savings. But for now we’re focused on raytracing and simplicity.